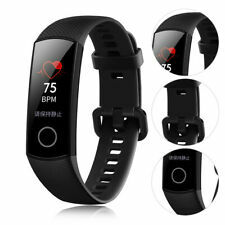 Huawei Honor band 4 Wristband 0.95" AMOLED Touch screen Bluetooth heart rate. Huawei announced theHonor band 4 at an event on September 5 in China. 1 x Huawei Honor Band 4. ● This is the standard version of Huawei Honor band 4, so it is without NFC function. 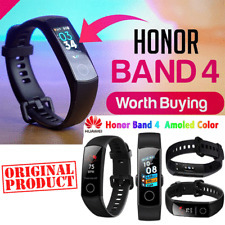 Original Huawei Honor band 4 Wristband 0.95" AMOLED Touch screen Bluetooth heart rate. Huawei announced theHonor band 4 at an event on September 5 in China. In this sense, this smartband is much more attractive when compared to the Xiao mi band 3, which is able to provide up to 24 Chinese characters. AMOLED multi-color touchscreen brings the seamless vision of a 2.5D display to your wristband. New HUAWEI Band 3 Pro AMOLED Touchscreen Heart Rate Waterproof Smart watch. • Support NFC. • Wristband material: silicone. Adopts injection moulding technology with its unique design, effectively prevents the Smartwatch from falling during strenuous exercise. 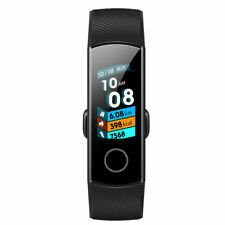 This Huawei Honor Band 4 Smart Wristband is based on Bluetooth technology and supports Android system 4.4 version or above, iOS system 9.0 version or above system. If you have received the object is Chinese display and manual, just install the application Huawei wear app in your smartphone and then connect it via the Bluetooth and then this clock will change the language as smartphone language after you successfully Connected by Bluetooth this will not affect your use. Huawei Watch 2 Sport Smartwatch - Ceramic Bezel - Carbon Black Strap - 45mm - by Huawei. Huawei Watch 2 Sport Smartwatch. This item will show moderate signs of use. No scratches on screen and bezel, minimal scratches on band buckle. 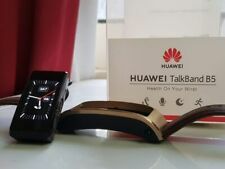 HUAWEI TalkBand B5. 24/7 heart rate monitoring with HUAWEI TruSeen™ technology. When you take a selfie or night shot, a quick touch on the band instead of your phone can effectively reduce your shot's blurriness from any handheld instability. Trending at $135.99eBay determines this price through a machine learned model of the product's sale prices within the last 90 days. New HUAWEI Band 3 AMOLED Touchscreen Heart Rate Smart watch. AMOLED multi-color touchscreen brings the seamless vision of a 2.5D display to your wristband. Forgot where you left your phone?. No worries! Watch is used, but in great physical and working condition. No scratches on the glass, bezel shows signs of wear. Black leather strap with quick release. Brown leather strap with quick release. Trending at $170.24eBay determines this price through a machine learned model of the product's sale prices within the last 90 days. Used Tested Working - no scratch on watch ,nice watch very good condition, full function. Condition is Used. It’s smart, redefined. Created using sophisticated materials like a scratch-resistant sapphire crystal, cold-forged stainless steel cases, and fine leather and stainless steel bands, the Huawei Watch’s style is just as advanced as its functional features. (Huawei glory 4 smart bracelet 0.95" AMOLED touch color screen heart. Display 0.95" AMOLED touch display. 3) Touch Pair, Huawei Health App will automatically search for the band, select Honor Band 4 from the list of available devices, and the band will start pairing with your phone. Huawei Watch 2 Sport Smartwatch - Ceramic Bezel - Carbon Black Strap.None LTE version, gotta be connected to watch for service. over all this is a great smart watch but I switched to apple. Also this has an temper glass insert protecting the watch face. Huawei Watch 2 Sport Smartwatch - Ceramic Bezel - Carbon Black Strap. Condition is Used and works great. Watch is in great condition. Includes USB charger as shown. Shipped with USPS First Class Package. Heart Rate Monitor,sleep monitoring. 1 x Smart Bracelet. Color: Black Blue Orange. Compatibility:Android 4.4 or above and iOS 8.0 or above. Bluetooth:Bluetooth 4.0. Are you curious about your sleep quality?. sleep monitor function will give you the answer. ●Sleep Monitor. Setting the alarm clock on the phone, the watch will remind you with vibration. When it's synchronized with your phone, the watch gives an alarm by beeping when the phone is more than 10m away from the smart bracelet. Bluetooth:Bluetooth 4.0. Heart Rate Monitor,sleep monitoring. 1 x Smart Bracelet. Compatibility:Android 4.4 or above and iOS 8.0 or above. Color: Black Blue Orange. Touch screen unlock,Anti-lost,Call/SMS reminder. 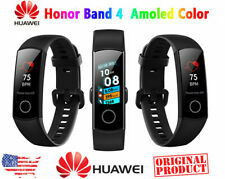 Huawei Honor band 4 Wristband 0.95" AMOLED Touch screen Bluetooth heart rate. Huawei announced theHonor band 4 at an event on September 5 in China. In this sense, this smartband is much more attractive when compared to the Xiao mi band 3, which is able to provide up to 24 Chinese characters. It was tested and is working properly. It is in like new condition and is in perfect shape with no scratches on the display or body of the watch. It was reset and previous accounts were removed from the watch. In good condition. Fully functional. Only the watch is included. No accessories. Used Tested Working full function ,good condition ,no scratches ,need see picture. Huawei Fit Smart Fitness Watch w/ Sleep, Heart Rate Monitor & Water Resistant. Shipped with USPS First Class Package. Charging: 2 pin. In great condition and works well! I switch to a Galaxy Watch so I no longer need this. Bluetooth version: Bluetooth 4.2, 2.4GHz. NETWORKTechnology No cellular connectivity. BATTERY Non-removable Li-Ion 420 mAh battery. Bluetooth 4.2, LE, EDR. COMMSWLAN No. 3.5mm jack No. SOUNDLoudspeaker Yes. Internal 128 MB, 16 MB RAM. Call records Yes. 1x Honor A2 wristband. If you have received the object is Chinese display, just install the application Huawei Health app in your smartphone and then connect it via the Bluetooth and then this clock will change the language as smartphone language after you successfully Connected by Bluetooth this will not affect your use. Used Huawei Watch 2, its color is Carbon Black with Sport Strap Used, Excellent Condition. Tested Working full function ,good condition ,no scratches ,need see picture. In FAIR condition. Fully functional. Only the watch is included. No accessories. When you take a selfie or night shot, a quick touch on the band instead of your phone can effectively reduce your shot's blurriness from any handheld instability. 24/7 heart rate monitoring with HUAWEI TruSeen™ technology. With a variety of watch faces to choose from, it’s ready to pair with any ensemble or occasion. Created using sophisticated materials like a scratch-resistant sapphire crystal, cold-forged stainless steel cases, and fine leather and stainless steel bands, the Huawei Watch’s style is just as advanced as its functional features. Xiaomi and Android Phone. Bluetooth Version: Bluetooth V3.0 EDR. Bluetooth Protocol: A2DP HFP 1.5 HS P 1.2. 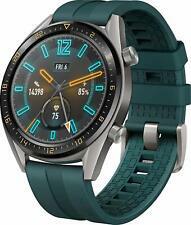 1 x Bluetooth Watch. Color: white, red, black. German, Turkish, Russian. Language Support: English, French, Spanish, Portuguese, Italian.